At the start of the year, renowned director M. Night Shyamalan released his thriller-horror film, Split. The film centers around a character with Dissociative Identity Disorder. This is not the first time DID has caught the interest of directors and screenwriters. Primal Fear and Fight Club, which both depict contentions with DID, helped Edward Norton gain countless awards and an immense amount of fame. The Crowded Room, a film that’s been “in development” for the past few years is said to revolve around the infamous Billy Milligan, a man who was acquitted on numerous criminal charges due to a successful insanity defense. Milligan and his 24 different personalities that granted him acquittal, will possibly be portrayed by Leonardo DiCaprio in The Crowded Room. The movie Split depicts a character with 24 different personalities on the big screen. The main plot is about a man named Kevin “Wendell” Crumb (James McAvoy), who had been abused by his mother throughout his childhood. Kevin shows evidence that he struggles with DID and has 23 different personalities to his therapist, Dr. Karen Fletcher (Betty Buckley). One of his personalities kidnapped 3 teenage girls, led by Casey Cook (Anya Taylor-Joy), who had also been through the traumatizing experience of being tortured by her uncle. The Monster, Kevin’s not yet triggered 24th personality, starts to materialize throughout the film and becomes more dominant and controlling than any of the other 23 personalities. 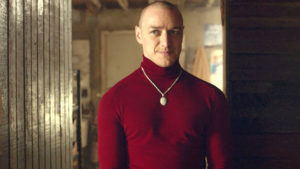 While McAvoy’s performance achieved praises from audiences, it seems that M. Night Shyamalan’s reputation was not helped much by the success of Split. Shyamalan earned the Golden Raspberry Award for Worst Director in 2011 and again in 2014. I personally still like this movie because it’s hard to not be captivated by the DID-disorder theme. In the film, the therapist, Dr. Fletcher, perfectly explains why the topic about DID is so fascinating for both artists and the audience: “Have these individuals, through their suffering unlocked the potential of the brains? Is this the ultimate doorway to all things we called unknown? Is this where our sense of the supernatural comes from?” The film makes us ponder about the capabilities of the human being and the wiring of the human brain. First-year Alice Lu is a staff writer. Her email is xlu@fandm.edu.